MARIO (V.O.) (sullen): "You ever feel like you were out of joint with the world, Doc? Like you didn't fit?" "It's 436 pages. This is not a movie, it's a manifesto. There has never been a produced film in America with a length of 436 pages." "Remember how disgusting the bedroom was? Multiply it by six and you have the bathroom. 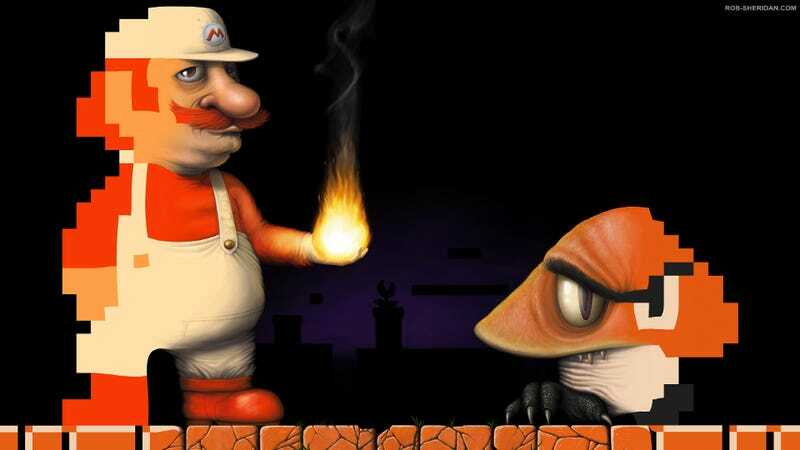 Mario stands at the mirror and looks at his yellowed teeth in the gray, flickering light. His toothbrush has mold on it and a cobweb." "He opens the mirror cabinet, revealing shelves full of prescription anti-depressants. He pours himself a cup of brownish water and retrieves a bunch of pills from their bottles but then the "MISSING CHILDREN" flier suddenly slaps up against the bathroom window (but blows away before he can get a look at it) and startles him into dropping the pills into the sink." "He stares at them and then begins carefully lining them up end to end, color-coding (this being a none-too-subtle reference to fan-favorite Nintendo game Dr. Mario). He looks at his newly formed grid, and then, very slowly, pushes the pills down the sink drain." "He runs the water, and watches them go. He grunts, and then looks up into the mirror. He looks awful." Then Mario has some pudding and a Heineken, makes sad braying noises at his plumber boss, and eventually gets drunk and stumbles into a magical realism scene involving a giant piranha plant. And that is only the beginning—or the very beginning of the beginning, more like, because again this thing is 436 pages long. So far it's totally weird and all-over-the-place and kind of endearingly obsessive. Landis himself says he thinks it's pretty horrible, but I'm finding it to be entertaining, if nothing else. Image credit goes to Rob Sheridan.